Zerotre is a nutrition education project created by Maria Stefania Peduzzi, owner of Rustichella d’Abruzzo and teacher in primary school. 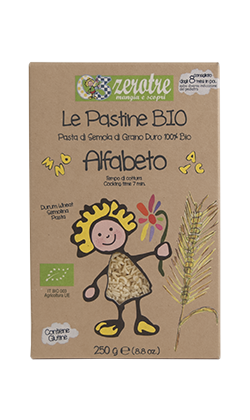 The Zerotre pastine (small-sized pasta) includes a collection of the types of pasta that children love the most, who tried them at school and chose the ones that met their tastes. Zerotre is a project for children but also for the mothers: it helps them give their children the most “difficult” food to appreciate, like fruits or vegetables. 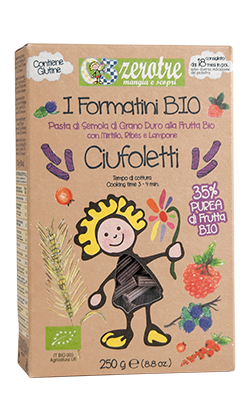 Since the quality of raw materials is essential, especially during childhood, Rustichella d’Abruzzo introduced primary school children to quality foods: small-sized pasta made with 100% organic high quality durum wheat semolina, extra virgin olive oil and organic mashed fruits or vegetables (not freeze-dried). Children have the right to get to know the best that nature offers, in a kitchen full of love like the one of their mothers. High quality durum wheat small-sized pasta, 100% organic. We recommend it with ZEROTRE organic “Pomodoro e Carote” sauce, made through slow boiling of tomatoes just like people used to do in the past. 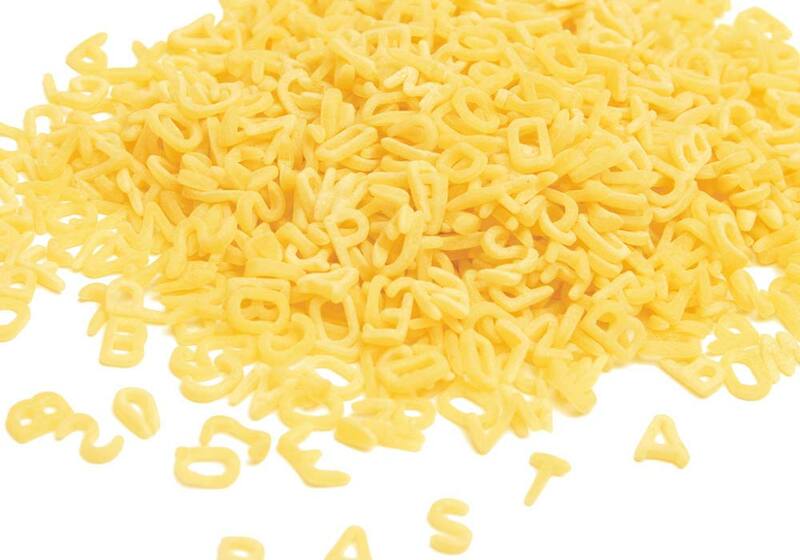 Perfect to season the first “pastasciuttine” (small-sized dried pasta) of your children. Cooking time: 7 minutes; recommended for children aged from 8 months and over, unless otherwise indicated by the pediatrician. 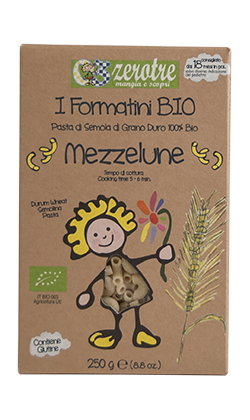 High quality durum wheat small-sized pasta, 100% organic. 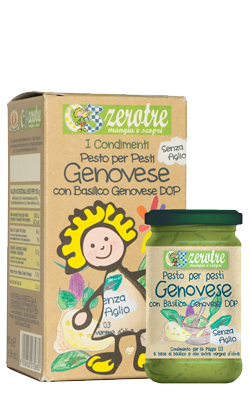 We recommend it with ZEROTRE Pesto alla Genovese D.O.P., creamy, with a delicate flavour and no garlic, particularly suited for the youngest children. 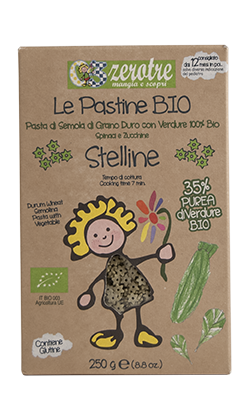 Perfect to season the first “pastasciuttine” (small-sized dried pasta) of your children. Cooking time: 11-13 minutes; recommended for children aged 12 months and over, unless otherwise indicated by the pediatrician. High quality durum wheat small-sized pasta, 100% organic. We recommend it with ZEROTRE Parmigiano Reggiano cream. The cream expresses the unity among environment, sustainable agriculture and healthy nutrition, with refined delicacy and selected ingredients. This combination reminds of a “healthy” version of the famous “Mac & Cheese” recipe, where Parmigiano Reggiano D.O.P., rich in proteins and calcium, is the main protagonist. Cooking time: 5-6 minutes; recommended for children aged from 18 months and over, unless otherwise indicated by the pediatrician. 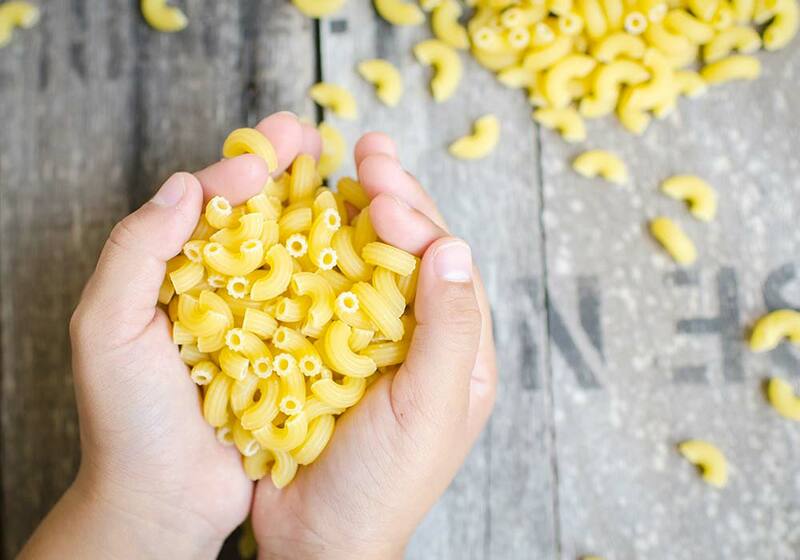 High quality durum wheat small-sized pasta, 100% organic. 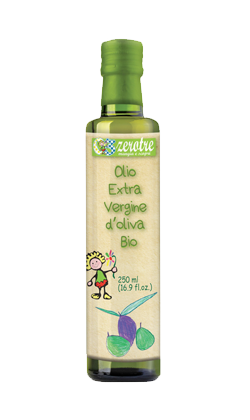 We recommend it with ZEROTRE extra virgin olive oil, an excellent source of energy and essential fat acids, produced with olives of organic agriculture, with a delicate flavour, particularly suited for the youngest children. 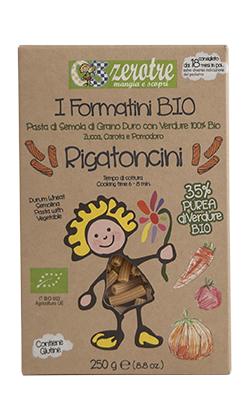 High quality durum wheat small-sized pasta, 100% organic, mixed with 35% of organic mashed vegetables (not freeze-dried): Pumpkin, Carrot and Tomato. We recommend it with ZEROTRE organic “Pomodoro e Carote” sauce, made through slow boiling of tomatoes just like people used to do in the past. 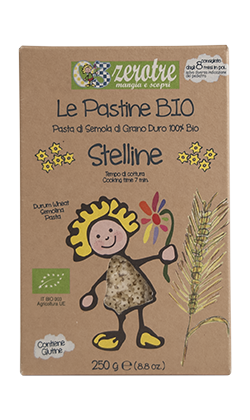 Perfect to season the first “pastasciuttine” (small-sized dried pasta) of your children. Cooking time: 7 minutes; recommended for children aged from 8 months and over, unless otherwise indicated by the pediatrician. High quality durum wheat small-sized pasta, 100% organic, mixed with 35% of organic mashed vegetables (not freeze-dried): Spinach and Courgettes. We recommend it with ZEROTRE organic Parmigiano Reggiano D.O.P. 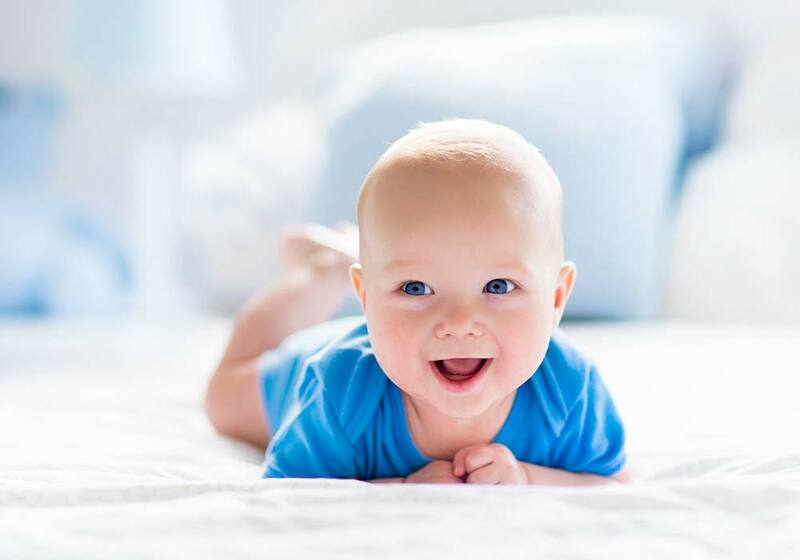 cream, which is rich in proteins and calcium and gives children all the nutritional intake of a top quality product. Cooking time: 7 minutes; recommended for children aged from 12 months and over, unless otherwise indicated by the pediatrician. 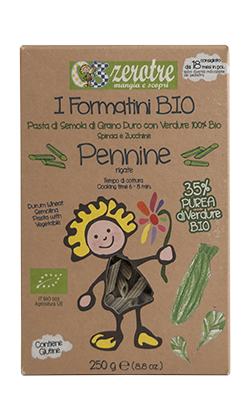 High quality durum wheat small-sized pasta, 100% organic, mixed with 35% of organic mashed vegetables (not freeze-dried): Spinach and Courgettes. 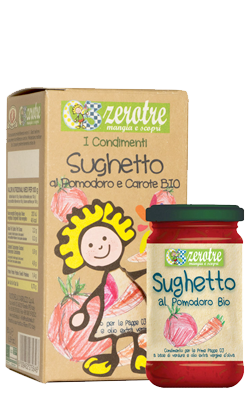 We recommend it with ZEROTRE organic “Pomodoro e Carote” sauce, made through slow boiling of tomatoes just like people used to do in the past, in order to give children a good, healthy and colourful food. Cooking time: 6-8 minutes; recommended for children aged from 18 months and over, unless otherwise indicated by the pediatrician. High quality durum wheat small-sized pasta, 100% organic, mixed with 35% of organic mashed vegetables (not freeze-dried): Pumpkin, Carrot and Tomato. We recommend it with ZEROTRE organic Parmigiano Reggiano D.O.P. cream, which is rich in proteins and calcium, with a bit of ZEROTRE extra virgin olive oil. Cooking time: 6-8 minutes; recommended for children aged from 18 months and over, unless otherwise indicated by the pediatrician. High quality durum wheat small-sized pasta, 100% organic, mixed with 35% of organic mashed red fruits (not freeze-dried): blueberry, currant and raspberry. We recommend it with ZEROTRE organic Parmigiano Reggiano D.O.P. cream, with a bit of ZEROTRE extra virgin olive oil. Cooking time: 3-4 minutes; recommended for children aged from 18 months and over, unless otherwise indicated by the pediatrician. High quality durum wheat small-sized pasta, 100% organic, mixed with 35% of organic mashed red fruits (not freeze-dried): blueberry, currant and raspberry. The combination with ZEROTRE extra virgin olive oil is perfect, for a first course with a delicate flavour. Cooking time 3-4 minutes; recommended for children aged from 18 months and over, unless otherwise indicated by the pediatrician. Whole wheat small-sized pasta with 5 cereals (high quality durum wheat semolina, farro, barley, oat and millet), 100% organic, mixed with 35% of organic mashed fruits (not freeze-dried): pear and kiwi. Durum wheat (rich in proteins), farro (rich in mineral nutrients and vitamins A, B, C and E), barley (facilitator of correct brain functions), oat (source of simple carbohydrates) and millet (high digestibility) compose a perfect mix for a valid nutritional intake of fibres. We recommend it with ZEROTRE Parmigiano Reggiano D.O.P. cream, rich in proteins and calcium, with a bit of ZEROTRE extra virgin olive oil. Cooking time: 8-10 minutes: recommended for children aged from 18 months and over, unless otherwise indicated by the pediatrician. 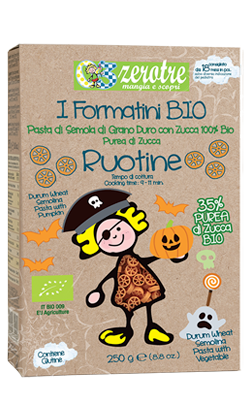 High quality durum wheat small-sized pasta, 100% organic, mixed with 35% of organic purée of pumpkin (not freeze-dried). 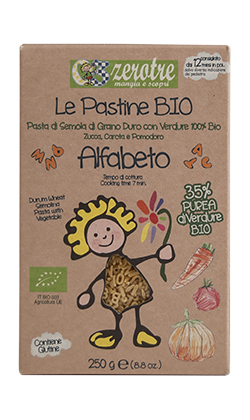 We recommend it with ZEROTRE organic “Pomodoro e Carote” sauce, made through slow boiling of tomatoes just like people used to do in the past, perfect to season the first “pastasciuttine” (small-sized dried pasta) of your children and give them a colourful dish. Cooking time: 3-4 minutes; recommended for children aged from 18 months and over, unless otherwise indicated by the pediatrician. 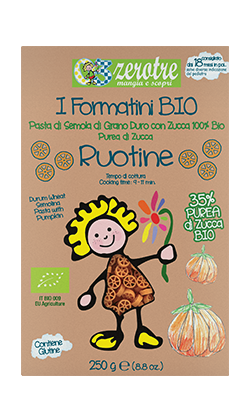 Rustichella d’Abruzzo has a new item for your children in the ZEROTRE line: “Le Ruotine” with 35% of organic purée of pumpkin! Besides being very good, pumpkins are also rich in carotenoids, phosphorus and vitamins A and C, all essential micronutrients for the growth of our children. Cooking time: 9-11 minutes. 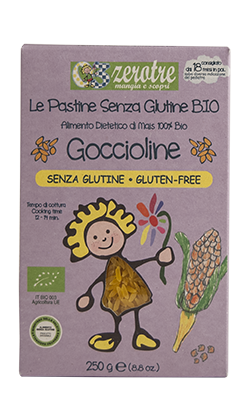 Corn flour Goccioline, 100% organic and gluten free, made for children who are intolerant to gluten or for mothers who want to vary their children’s nutrition. We recommend it with ZEROTRE Parmigiano Reggiano D.O.P. cream, rich in calcium and proteins, with a bit of ZEROTRE extra virgin olive oil. Cooking time: 12-14 minutes; recommended for children aged from 12 months and over, unless otherwise indicated by the pediatrician. Corn and rice Mezzelune, 100% organic and gluten free, made for children who are intolerant to gluten or for mothers who want to vary their children’s nutrition. We recommend it with ZEROTRE Pesto alla Genovese D.O.P., creamy and with a delicate flavour and no garlic. Cooking time: 3-5 minutes; recommended for children aged from 18 months and over, unless otherwise indicated by the pediatrician. 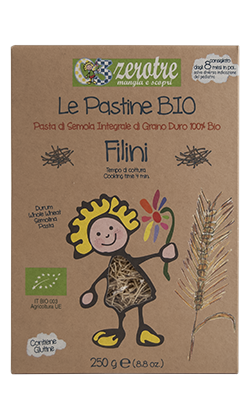 High quality whole wheat Filini, 100% organic. 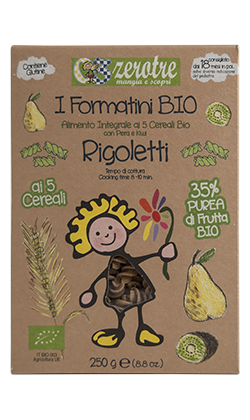 Rustichella d’Abruzzo wants to make children from very early age start appreciating whole wheat cereals, rich in fibres, vitamins and mineral nutrients, for a healthy and complete nutrition from a very early age. It can combine with all ZEROTRE condiments: organic “Pomodoro e Carote” sauce, “Pesto per pesti alla Genovese” D.O.P., Parmigiano Reggiano D.O.P. cream, or with just a bit of ZEROTRE extra virgin olive oil. Cooking time: 4 minutes; recommended for children aged from 8 months and over, unless otherwise indicated by the pediatrician. For a safe nutrition, Rustichella d’Abruzzo presents a really tasty sauce to season baby food. Made through slow boiling of rigorously organic and high quality tomatoes, carrots, onions and extra virgin olive oil, as people used to do in the past. 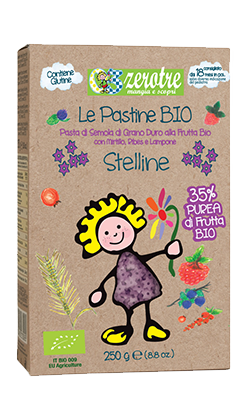 The flavour of Mediterranean tomato in a delicate and well-balanced sauce, perfect to season the first “pastasciuttine” (small-sized dried pasta) of your children. No preservatives and no colourants, it is excellent for a quick lunch, just the time to slowly heat it, and ready in very few minutes. Before serving, it is recommended to add a bit of ZEROTRE organic extra virgin olive oil. Rustichella d’Abruzzo makes this sauce with all of the traditional ingredients of Pesto alla Genovese D.O.P. : perfumed Genoa basil D.O.P., Grana Padano cheese, Pecorino cheese, pine nuts, cashew nuts and extra virgin olive oil, with no garlic. A creamy and delicate pesto suitable for the youngest children and quick to prepare, just the time to slowly heat it and pour it directly on the pastina, adding a bit of ZEROTRE extra virgin olive oil. Rustichella d’Abruzzo presents, in the ZEROTRE line, the “Crema di Parmigiano Reggiano”, a condiment based on Parmgiano Reggiano D.O.P. cheese, a product that combines environment, sustainable agriculture and healthy nutrition. Parmigiano Reggiano D.O.P. 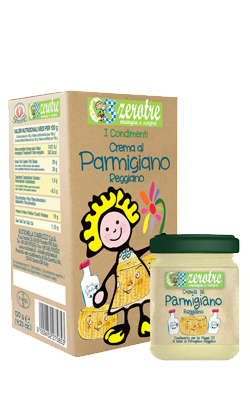 cream, with its refined delicacy and top quality ingredients, is rich in vitamins and calcium and suited for seasoning the first “pastasciuttine” (small-sized pasta) of your children. Ready in very few minutes, just the time to slowly heat it and pour it directly on the pastina. There is a new sweet thing for children’s snack from now on. 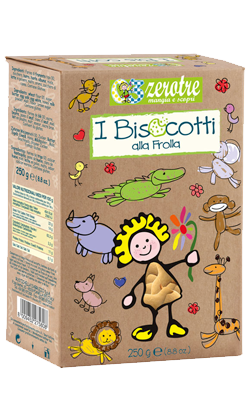 ZEROTRE Shortbread biscuits were created from a recipe of Rustichella d’Abruzzo’s artisan confectionery tradition, putting together tastiness and nutritional intake, with a touch of cheerfulness and crunchiness. They are very tasty when dunked in milk and excellent to be munched at any time of the day. There is a new sweet thing for children’s snack from now on. 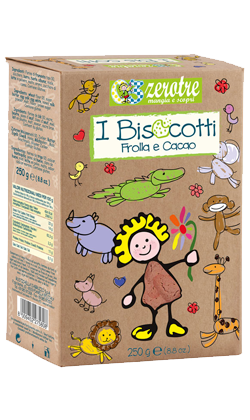 ZEROTRE Shortbread and Cocoa biscuits were created from a recipe of Rustichella d’Abruzzo’s artisan confectionery tradition, putting together tastiness and nutritional intake, with a touch of cheerfulness and crunchiness. They are very tasty when dunked in milk and excellent to be munched at any time of the day. There is a new sweet thing for children’s snack from now on. 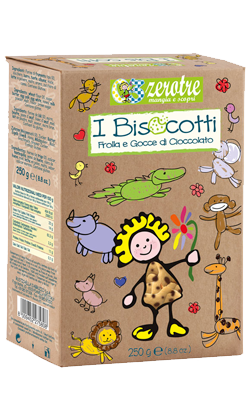 ZEROTRE Shortbread biscuits with delicate Dark Chocolate Drops were created from a recipe of Rustichella d’Abruzzo’s artisan confectionery tradition, putting together tastiness and nutritional intake, with a touch of delicacy. They are very tasty when dunked in milk and excellent to be munched at any time of the day. Rustichella d’Abruzzo is perfectly aware of the importance of Extra virgin olive oil in a well-balanced children’s nutrition. It is a good source of energy with essential fat acids and antioxidant polyphenols (decisive elements in children’s growth) and can be used raw on ZEROTRE small-sized pasta or baby foods. Rustichella d’Abruzzo organic extra virgin olive oil is composed by organic olives that are cold-milled right after harvesting and have a fruity aroma and a delicate flavour, particularly suited for the youngest children.